After a tasty breakfast we dropped the roof on the MR2 and set off towards Applecross via the Bealach Na Ba, the road with the greatest climb in the UK – sea level to 2,053ft. By the time we’d got to the bottom of the pass we’d already stopped to put the roof back up as it was raining. This set the scene for the day, I lost count of how many times the roof went up or down. As we climbed up the pass, the rain turned to snow, not what we were expecting! By the time we reached Applecross the sun was out again, we went for a light lunch at the walled garden, before exploring the grounds of Applecross House on foot. From Applecross we followed the coast road round to Shieldaig, briefly interrupted by some highland cows in the road. Again, we managed to time our arrival to Shieldaig with a gap in the weather, we sat outside the new Nanny’s shop having an ice cream in the sun – perfect! We returned to Applecross, via the Bealach Na Ba in much nicer weather, for dinner at the famous Applecross Inn. It was good to see that so many of the items on the menu were sourced from around the village. I can confirm that the local scallops are very tasty. We retuned to our chalet in Lochcarron, but this trip over the pass had an audience – the local stag population were lining the road, much to Jen’s excitement. Distance so far: 678 miles. 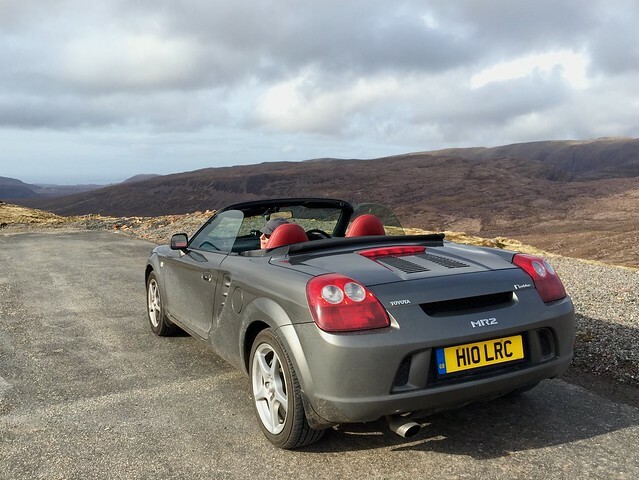 This entry was posted in Roadtrips and tagged iPhone, MR2, MR2 roadtrip, Photo, Roadtrip, Scotland by Lewis. Bookmark the permalink.